Special Dharma Friend Talk with two long-time meditators and students of Lama Yeshe and Lama Zopa Rinpoche: Merry Colony & Harry Sutton. Both Merry & Harry have served Lama & Rinpoche for over 35 years: Merry since 1980; and Harry since 1975; they have done extensive retreat in the Nepalese Himalayas; offered extensive service to FPMT, Lama & Rinpoche’s organization; and are two of the warmest, kindest people you’ll ever meet! Come for a Dharma talk and Q & A with these two incredible, devoted practitioners. Bring any questions you might have about practice, the Buddhist path, retreat, life! A free event, offered by Gonpo Ludup Study Group. Merry with a young Cherok Lama in Nepal in 1995, the recognized reincarnation of the previous Cherok Lama, a great Nyingmapa yogi & meditator. In 1979, a free-spirited 22-year-old American girl from eastern Massachusetts named Merry Colony received an undergraduate degree in Environmental Science from the University of California, Santa Cruz. She had already decided that she had to leave friends, family and country for a spiritual path following her graduation. She spent the following summer in Alaska and took a Trans Canadian train back to the East Coast to swap tearful goodbyes with family before traveling to Santa Cruz to prepare for her next journey. While settling her affairs in California, she did a lam-rim retreat with Zazep Tulku and some students fromVajrapani Institute. During that retreat she saw a poster of Lama Zopa Rinpoche. The poster was an advertisement for a nyung nä retreat in Lawudo, Nepal. She recalls, “I knew that was it. 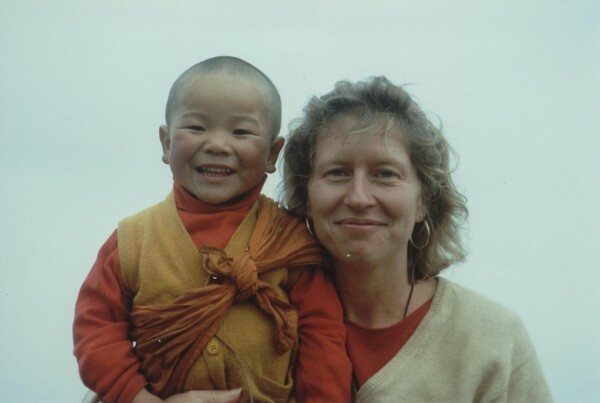 That this was where I had to be and who I had to be with.” She left for Lawudo in January 1980, attending the March meditation course at Kopan Monastery on her way… Click here to read the full story. Tibet! Tibet! I Have to Go to Tibet! 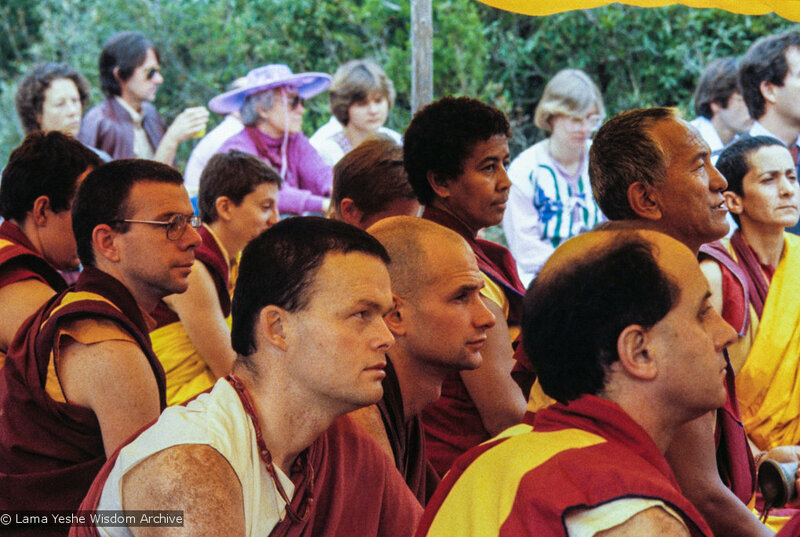 Harry at Lama Yeshe’s Cremation at Vajrapani, our center in the Santa Cruz Forests, in 1984. The beginning always has to go to the guru Buddha. When one looks for the cause or the condition which brought one to Kopan, I think it always goes back to the initial cause condition, the holy kind guru. That can happen years before someone even hears about Kopan, thinks about Kopan or sees Kopan. Because of not being intelligent, and quite lazy, high school ended a couple of years early, so I took that time to work and travel all around North America and Europe. Through hitchhiking, I got to meet people, to find out what was going on in their lives. Many times there was not a destination, just going, getting into cars, trucks and people’s lives. It didn’t matter which side of the road to stand on, if I was going north, south, west or east. And when the ride was finished, after listening to their life stories, when the door was closed, I thought: “That’s one life I don’t have to go through.” I lived it through them, for that five-minute, five-hour or two-day ride. Besides, the result was always the same: their lives had discontent, dissatisfaction. After trying everything out in life that the world had to offer for experiencing happiness, I found myself alone and praying into space. I didn’t believe in god but knew there was something greater than me in the universe. And I prayed. And I prayed. I said, usually with tears in my eyes: “May I meet the perfect teachings and the perfect teacher to help my life and others.” I said that every night. After three months of doing this I felt a very strong feeling in my heart, it had a pull to it. And with that pull in my heart was the mantra: “Tibet, Tibet, I have to go to Tibet. Tibet, Tibet, I have to go to Tibet. Tibet, Tibet, I have to go to Tibet.” Click here to read the full story. Saturday, Oct 7, 6 – 7:30 p.m.